Power with punch. Federal® Power-Shok in a deep range of calibers and types for every hunting application. With Speer® soft-point bullets for maximum-expansion power hits. 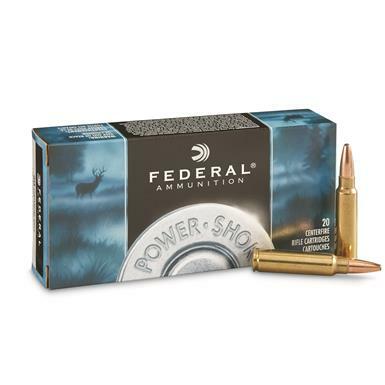 Federal Power-Shok, .300 Savage, SP, 180 Grain, 20 Rounds is rated 4.8 out of 5 by 5. Rated 5 out of 5 by Sean from Dead right there Used this in my old 99. One black bear, 175 yrds, one shot. No tracking necessary. Rated 5 out of 5 by Woodsman from Exceptional bullet design. I have hunted medium sized game for over 40 years with different guns but, generally using my favorite a Savage model 99 chambered for .300 sav. . the federal power-shok 180 gr. has performed extremely well in every case I have ever encountered. Very pleased with its performance on every level. Rated 5 out of 5 by ROCKY4570 from FANTASTIC CARTRIDGE I've been shooting a 99 Savage in 300 Savage for 40 years. I hunt deer and hogs and have shot both out to 400 yards. Most shots are 200 yards or less and the ammo performs flawlessly. I'm getting 1/2" groups at 150 yards out of this ammo! Off a rest I have no problem hitting the longer shots. Rated 4 out of 5 by RANDY & PATRICI from these are a good round for the 300 savage. I took a 250 lb black bear with two rounds this past deer season with no problem at all. Among the most effective hunting rounds using programmed expansion memory.